President Abdel-Fattah El-Sisi will inaugurate and chair the Arab-EU summit in Sharm El-Sheikh on Sunday. In his opening remarks to the summit the president is expected to reiterate the same message he delivered at the Munich Security Conference earlier this week: that stability in the Middle East is crucial for the safety and stability of the Mediterranean region as a whole. Sisi’s recipe for stability — development and security — is already known to his European interlocutors and Arab partners. 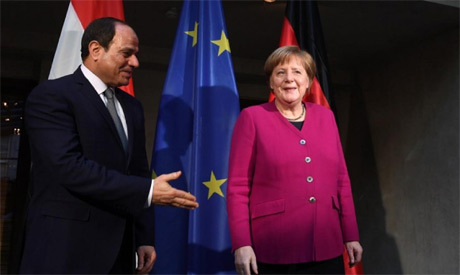 “I guess there is enough consensus around the Mediterranean, in Europe and in the Arab world, that rather than taking chances on democracy it is perhaps best to settle for stability rather than rock the boat,” said a Cairo-based European diplomat. The diplomat added that “eight years after the drama of the Arab Spring revolutions” almost all European countries agree that sudden waves of political uprising followed by years of upheaval need to be avoided. “I guess it is significant the EU has not adopted a particularly tough stance on developments in Sudan. The reason is we are not sure how things would be managed if Omar Al-Bashir was to step down in the face of the protests there,” said another European diplomat in Cairo. The pursuit of stability is why most European capitals are turning a blind eye to the recent announcement that Algerian President Abdel-Aziz Bouteflika will stand for a fifth term despite the decline in his health following a stroke in 2013. “There is no agreement about the succession in Algeria and nobody wants chaos there,” said a third European diplomat in Cairo. “We are not planning major pronouncements on democracy and human rights in the communiqué we are currently negotiating for the end of the summit. There will be some references of course, but the accent will be on stability,” said a European source close to preparations for the summit. Another source explained that the political leanings of ruling governments in Europe make it “only too obvious” that stability in the southern Mediterranean trumps all other concerns. “And to be brutally honest, it seems that stability is the preferred choice of the peoples of the region too,” he said. The summit will, however, be convening in Egypt without two Arab leaders — Sudanese President Al-Bashir and Saudi Crown Prince Mohamed bin Salman — whose alleged human rights violations could embarrass their European counterparts. An informed Egyptian official says Cairo did nothing to deter either Al-Bashir or Bin Salman from attending. Al-Bashir, he said, chose to miss the meeting for his own reasons. The Sudanese president is the subject of two arrest warrants issued by the International Criminal Court in 2010. Since then Al-Bashir has avoided overseas trips except to Arab and African states where he knows there is no threat of extradition. “The Saudi monarch is planning to head the delegation himself while the crown prince is on an Asian tour that began before the scheduled Arab-EU summit,” said the official. Arab and European sources close to preparations for the summit said there was never any intention of inviting Bashar Al-Assad given the lack of agreement between leading Arab states and their Western allies, especially the US, over re-engagement with the Al-Assad regime. Syria will, however, feature on the summit’s agenda, say sources. Iranian influence in the country, eliminating the presence of militant movements, and the issue of refugees will all be discussed. European foreign ministers addressed the Syrian crisis earlier this week at the EU headquarters in Brussels where they spoke not just of the impact of the Syrian crisis on the waves of refugees crossing the Mediterranean into Europe but also the fate of European nationals who left for Syria to join radical militant groups like IS. No one should expect radical statements on Iran to emerge from the Sharm El-Sheikh summit. Neither the Europeans nor the majority of Arab states — and certainly not Egypt — want a verbal escalation against Iran. The Sharm El-Sheikh summit will therefore restrict any communiqué to the usual demands Tehran refrain from interfering into the affairs of neighbouring Arab states, rehashing the formula used in Arab League resolutions. With the exception of Saudi Foreign Minister Adel Al-Jubeir, Arab participants at last Thursday’s summit on security in the Middle East hosted by Warsaw were restrained in their comments on Iran even though the gathering was originally proposed by Washington as an anti-Iranian platform. Though Israeli Prime Minister Benjamin Netanyahu claimed that Arab countries had sided with Israel in Warsaw against Iran what actually emerged was a series of leaks of meetings and exchanges of warm smiles between Netanyahu and several Arab foreign ministers. In an explanatory statement on Monday Oman’s foreign minister said that the talks that Arab, especially Gulf, leaders had with Netanyahu were designed to give a push to the peaceful settlement of the Palestinian cause. With the announcement of US President Donald Trump’s long awaited peace plan now expected sometime after Israeli elections in April, Palestinian President Mahmoud Abbas is expected to use the Sharm El-Sheikh summit to reiterate his objections to Washington’s plans which Palestinian diplomats say will be “a disaster that undermines Palestinian rights that nobody can sign up to”. Arab leaders who may want to pressure Abbas into giving the Trump plan a chance are likely to find their hands tied by the fact the summit is convening days after Netanyahu assigned the Israeli Foreign Ministry to Israel Katz, the Likud politician who has repeatedly said the time is not right for a two-state solution. In the end the Sharm El-Sheikh summit is unlikely to result in more than a statement of continued cooperation between the EU and allied Arab states on controlling migration in return for development packages. The high-profile Arab presence will, however, allow Arab leaders to meet and discuss the fate of the Arab summit scheduled to take place in Tunis late in March, the possible outcomes of which have attracted growing scepticism.